Imagine if you and your best friend were avid travelers, but few roads were built that you could roam together. Or if you were both gifted musicians, but few works were written that you could play together. For pianists Karen and Jeffrey Savage, the second scenario is especially familiar. But, just as they’ve tackled more formidable challenges, the duo has worked to overcome this musical hurdle—together. 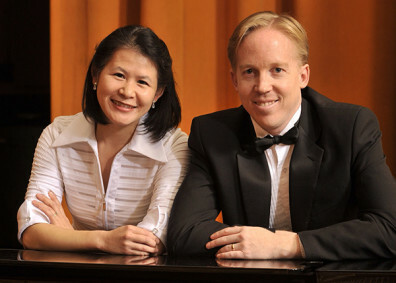 On faculty in the School of Music since 2005, the married pair, also known as 88SQUARED, has played piano in both the four-hand form (at one instrument) and the two-piano form since they first met more than two decades ago. Over the years, their complementary styles melded and evolved to award-winning heights. As their duo repertoire grew and invitations to perform increased and spread around the world, they felt limited by the relatively few compositions written for two pianos. So they decided to do something about it. In 2012, shortly after Karen gained tenure-track status, she applied for a new faculty seed grant through the WSU Office of Research to support the commissioning and recording of a brand new composition for duo piano. “We wanted to build our own repertoire and to help build the available body of works for others to perform,” she said. Leveraging the research seed grant, the couple went to work gathering enough additional support to commission an extraordinary new work for piano duo by one of the world’s foremost modern composers, Lowell Liebermann, and to fund a recording of his collected two-piano works. They competed against hundreds of other applicants to win a prestigious Artist Trust grant and received additional funding from the National Federation of Music Clubs, the Washington State Music Teachers Association, the CAS dean’s office, and the School of Music. As described in their project proposal, the couple would seek professional coaching from distinguished artist–teachers at three internationally prominent conservatories, including the Juilliard School where, years earlier, they earned their master’s and doctoral degrees. In July 2012, with Liebermann at work on the creation of an exciting, new composition, they were on track to professionally record and perform the world premiere of a dynamic, new piece of music, just the way they’d long hoped—together. That’s when, at age 39 and with a toddling son at home, Karen was diagnosed with stage-three breast cancer. The recording project was put on hold. During the ensuing year of intense cancer treatment and surgery, Karen underwent an extended regimen of chemotherapy that carried with it another type of threat: permanent neuropathy, or numbness in the extremities, such as fingers. Knowing her life’s work was as a pianist, her doctors took extra care to monitor her treatment and minimize any risk to her hands and fingers. Their efforts were successful. With Jeff, her musical and life partner, beside her, Karen regained her health while their research and recording project regained momentum, as well. “It’s kind of a showpiece, with wonderful colors and harmonies, and architecturally very satisfying for both the performers and the audience,” Jeff said. Composed in four movements, the sonata includes a scherzo the duo describes as “impish and playful.” It finishes with “one of the most exciting finales—a virtuoso powerhouse,” Jeff said. 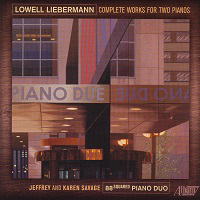 Their new CD, Lowell Liebermann, Complete Works for Two Pianos, was professionally recorded by Dave Bjur, School of Music recording engineer, utilizing the school’s state-of-the art equipment. Produced by Liebermann, it was released in October by Albany Records and is being aired on National Public Radio and commercial stations nationwide. “Other duos are already starting to play the sonata that we commissioned, which is very exciting for us because we feel like we contributed to something that was really needed,” Karen said. He described his new sonata as “a challenge” to perform. 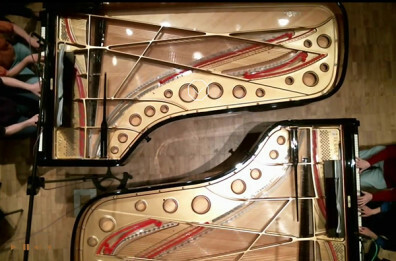 “One of the things listeners might not be so aware of is the problem that just the physical distance between the two performers sitting at two pianos creates. When you have a string quartet, for example, everybody is very close together and the communication is very immediate, but when you have two pianists separated with the two pianos in between, that can become very tricky…. [S]omething like the very difficult and intricate counterpoint in the last movement of the sonata becomes fiendishly difficult,” he said. Two views of the matching Fazioli grand pianos in Kimbrough Concert Hall being played by Jeff and Karen Savage, right, and Lowell Liebermann and William Hobbs on piano II. 88SQUARED recently performed two-piano works by Liebermann and other notable composers for appreciative audiences in Canada, Chicago, New York, and Pullman; more venues are scheduled throughout the coming years. Winner of the 2009 Ellis Piano Duo Competition and numerous other prizes, 88SQUARED is regularly invited to perform at prestigious music halls and scholarly conferences worldwide. You can listen to 88SQUARED performing Liebermann’s “Daydream and Nightmare” on YouTube. You can also watch a video excerpt of the WSU recording session of the work performed by Liebermann, Hobbs, and 88SQUARED.